What is Skyscanner Ads Manager? Skyscanner Ads Manager is a new simple to use platform which will allow you to set up, create, target and manage your own advertising campaigns which can be served on Skyscanner. Build your campaign, customise your creatives and we'll take care of the rest. 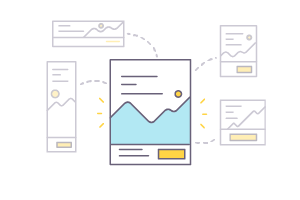 With key reporting and analytics you'll be able to log in and see how your advertising campaigns are performing in real time. How does Skyscanner Ads Manager work? What type of ads will I be able to set up? 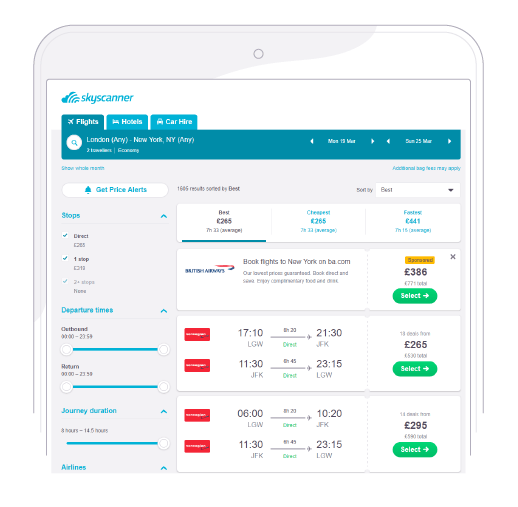 Promote your brand and flight options at the top of the Skyscanner flight search results pages to reach an audience who are ready to book flights. Simply provide the creative and specify a URL to be featured at the top of the search. Promote your brand and hotel booking options at the top of the Skyscanner hotels search results page to reach travellers who are actively looking to book a hotel. All you need to do is provide a creative and a URL. Inspire and captivate travellers to fly to a specific location with this customisable ad unit. Feature your brand colours, logo, and creative along with destination imagery on our flights search results pages capable of reaching a wide range of potential travellers. Promotion on the Skyscanner homepage to get your brand in front of a huge amount of travellers who want to be inspired and actively looking for travel options that they can book. Simply provide us with your email and company name and we'll be in touch with more information about the Beta trial.